By Angie Drobnic Holan, Amy Sherman on Tuesday, December 11th, 2018 at 9:30 a.m. In the days after 17 people were viciously gunned down at a high school in Florida, the state’s Republican governor called for tighter gun laws and President Donald Trump hosted victims’ families in the State Dining Room. The nation seemed steadfast in seeking answers and finding solutions. "It’s not going to be talk like it has been in the past," Trump said. "It’s been going on too long. Too many instances, and we're going to get it done." But in the shadows, the internet engine of hoaxes and smears had started. The lies went like this: David Hogg, an outspoken student of Marjory Stoneman Douglas High School, was really a "crisis actor" coached on what to say. Hogg wasn’t even from Florida, he was from California. Students, who began to advocate for restrictions on guns, had secretly organized before the shooting or were backed by radicals with a history of violence. Another student, Emma González, was a communist with ties to Cuba. She even ripped up the U.S. Constitution. The students and the country were about to learn a hard lesson about participating in democracy in 2018. That you don’t have to be a politician to be on the receiving end of the internet’s worst hoaxes. That the lies don’t vanish after being debunked. That the same hoaxes will spread again after the next attack. At least there was this: During a time of so little bipartisanship, the attacks on the Parkland students set off a shared outrage in nearly all political corners. "Claiming some of the students on TV after #Parkland are actors is the work of a disgusting group of idiots with no sense of decency," wrote Sen. Marco Rubio, R-Fla., on Twitter on Feb. 20. "THIS CONSPIRACY THEORY IS INSANE," tweeted U.S. Rep. Ted Lieu, D-Calif. "Our kids know David Hogg. My wife and I know his mom, who taught at our kids' elementary school before they moved to Florida. Although David is very articulate, he is not a crisis actor." In another year of lament about the lack of truth in politics, the attacks against Parkland’s students stand out because of their sheer vitriol. Together, the lies against the Parkland students in the wake of unspeakable tragedy were the most significant falsehoods of 2018. We name them PolitiFact’s Lie of the Year. School shootings have become regular occurrences in the United States: Columbine in 1999, Virginia Tech in 2007, and Sandy Hook in 2012. In the days after the Parkland shooting, the Florida students’ grief became a demand for political solutions. They wanted their trauma to be the last. The Saturday after the shooting, student Emma González stood at a bank of microphones at a Fort Lauderdale rally and yelled through angry tears, "They say that tougher gun laws do not decrease gun violence. We call BS! That us kids don't know what we're talking about. That we're too young to understand how the government works. We call BS!" At the candlelight vigils and rallies held in the days immediately following the shooting, the students came together and developed plans. By Sunday, students appeared on all the morning news shows to announce their idea: a nationwide march, in Washington and in cities around the country, to demand action on guns. They called it the March for Our Lives. At its outset, the march was political, and students went directly after the largest gun rights advocacy group in the country, the National Rifle Association. "At the end of the day, this isn't about the red and blue, the GOP and the Democrats. This is about adults and kids. And at this point, you're either with us or against us," student Cameron Kasky said on Fox News Sunday. "We are giving all our politicians a clean slate and in the next election, we are saying if you are accepting money from the NRA, there is a badge of shame on you because you are enabling things like this to happen." The online rumors and conspiracy theories started that weekend and really took off on the Monday and Tuesday a week after the shooting. Relatively obscure online sites said that the students were "crisis actors," and that student David Hogg, then a high school senior with journalism experience, was an actor from another state brought into Florida by anti-gun activists. Those rumors were fanned by Alex Jones’ conspiracy website InfoWars, which played up the suggestion that Hogg was coached and from out of state. (The "evidence" for the claim was that before the shooting, when Hogg had been on vacation in California, a Los Angeles TV station had interviewed him about his interactions with an argumentative lifeguard.) PolitiFact rated both claims Pants on Fire. Almost simultaneously, the online rumors moved from the fringes to the mainstream political battlefield. In Florida, a state legislator’s aide made the claim about crisis actors to a Tampa Bay Times reporter on Feb. 20; the aide was fired for repeating false conspiracy theories, and Florida’s House speaker apologized to the students. Outright lies morphed into suspicions about the students’ connections. Also on Feb. 20, Donald Trump Jr. liked a tweet by a conservative TV show host Graham Ledger that linked to a story by the Gateway Pundit website stating that David Hogg was "coached on anti-Trump lines." On Wednesday, a full week after the shootings, the top trending video on YouTube was a clip that used actual news footage (the interview of Hogg on vacation) but claimed to show Hogg was an actor. YouTube removed the video and apologized for it, telling media outlets: "Because the video contained footage from an authoritative news source, our system misclassified it. As soon as we became aware of the video, we removed it from Trending and from YouTube for violating our policies. We are working to improve our systems moving forward." The Russians also pushed out messages that supported Parkland students’ agenda, said Bret Schafer, an analyst with the project. "In the case of Parkland, the Kremlin and its proxies obviously did not care whether we enacted stricter gun control laws — they cared about keeping us fighting amongst ourselves," Schafer said. The outright lies against the Parkland students were easily debunked. Journalists from around the country descended on south Florida, documenting the shooting’s aftermath and interviewing student eyewitnesses. In a February TV interview at a rally at the state capital in Tallahassee, Hogg said he was undeterred by online smears and believed they came from people who didn’t want to see any new restrictions on guns. The lies seemed to generate sympathy for the students ahead of the March for Our Lives rally in Washington March 24. But they didn’t fade entirely into the background. Sarah Rumpf, a reporter for conservative news website RedState, thought she found a scoop tucked in the middle of an interview Hogg gave to CBS. In the interview, Hogg described the day of the shooting, and said, "I got my camera and got on my bike and rode as fast as I could three miles from my house to the school to get as much video and to get as many interviews as I could because I knew that this could not be another mass shooting." "Something doesn’t add up here," Rumpf wrote. "If Hogg was at school when the shooting began, saying he heard gunshots and the fire alarm, then why is he talking about riding a bike three miles to get to school on the day of the shooting?" Her March 26 story published quickly and spread quicker. Versions appeared on InfoWars, a leading conspiracy website, and the Gateway Pundit. It bounced to lesser known blogs, and across social media where it was shared by thousands of people, according to data kept by Hoaxy, which tracks social media misinformation. But the story was bogus. Very shortly, Rumpf knew the premise was wrong. Hogg had raced back to the school around 6 p.m. the evening of the shooting to interview students. Hogg was actually at the school during the shooting and shot a video on his cellphone while taking cover in a classroom closet. Rumpf updated her post and apologized for the error. "If you don’t read further, just know this: David Hogg was absolutely on campus during the shooting," Rumpf wrote. "I have zero doubt about that, and deeply regret the part I played in adding confusion and animosity to an already heated debate." In the weeks and months after the shooting, adults who knew the students got a first-hand look at how ugly American politics was. In 2016, conspiracy theories were aimed at politicians like Hillary Clinton or Ted Cruz’s father. Now it was the kids next door. PolitiFact contacted March for Our Lives for this story. They declined interviews. Jeff Foster, an Advanced Placement government teacher at Marjory Stoneman Douglas, told PolitiFact he was mortified by the false information that spread about his students. It steered some conversations in the days immediately after the shooting. "I had legitimate friends asking if David Hogg is a real person — it was crazy," he said. "To this day, someone sees one story that sort of contradicts a real narrative, and they just take it as absolute truth." Foster said that the students took the false attacks in stride: "They just keep trudging on — they stayed on message. They were frustrated with misinformation, but I don’t think it deterred them." Rumors about "crisis actors" have occurred after other shootings, but Parkland elevated it, said Kate Starbird, a University of Washington professor who studies misinformation online during crisis events. "Before Parkland, I used to talk about ‘crisis actors’ rumors and only a few people would know what I was talking about," she said. "After Parkland, everyone had heard the term. Part of this was likely media coverage of the misinformation — it’s hard to disentangle the misinformation strategies from the amplification effects." U.S. shooting events have become thoroughly politicized, she said, and online commenters move quickly to blame the shooting on a particular group to score political points. "This activity does appear to be increasing in volume and organization," she said. PolitiFact has debunked multiple false claims of shooters having particular political ideologies. After a May school shooting in Santa Fe, Texas, a fake Facebook profile depicted the alleged gunman wearing a hat showing support for Hillary Clinton’s 2016 presidential bid, with a background photo displaying a banner espousing anti-fascists, or Antifa, views. In recent years, journalists have debated whether reporting on fringe actors or extremist political ideology has a harmful amplification effect. In some cases, it likely does. But in the case of Parkland, PolitiFact began receiving reader requests almost immediately to fact-check claims as people online saw the misinformation. They wanted documentation that it wasn’t true. The attacks on the Parkland students seemed like a proxy battle over gun control. If the students could be discredited, their calls for changing law would be ignored. But events didn’t play out like that. In Florida, Gov. Rick Scott, a Republican and a longtime ally of the National Rifle Association, quickly signed legislation raising the state’s age to purchase guns from 18 to 21. Scott said he opposed parts of the bill that included an enhanced waiting period to buy a gun, but overall he believed the legislation would create a safer environment at schools, and he specifically praised the students as he signed the legislation. "To the students of Marjory Stoneman Douglas High School: You made your voices heard. You didn’t let up. And, you fought until there was change. You helped change our state. You made a difference," Scott said in prepared remarks. A few weeks later, the March for Our Lives was held in Washington and broadcast nationally. Throughout 2018, states around the country enacted stricter laws, and some corporations moved to cut ties with the NRA. While Congress continues to reject a ban on assault weapons or expanding mandatory background checks, President Donald Trump signed a bill to make improvements to the National Instant Criminal Background Check System, or NICS. 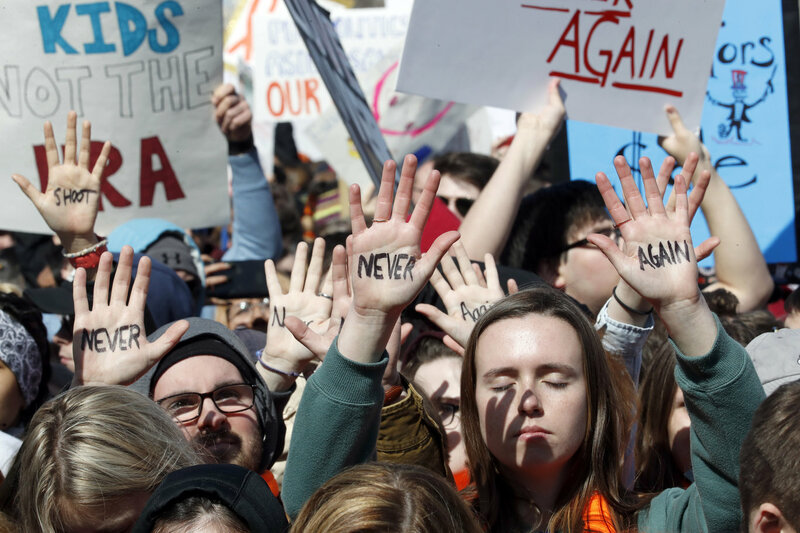 Sean Kirkendall, policy director of the Brady Campaign to Prevent Gun Violence, noted that a bill to expand background checks introduced in 2017 saw the number of cosponsors soar after Parkland to more than 200. That level of support for a gun violence prevention bill is unprecedented, he said. In July, members of the U.S. House of Representatives grilled tech executives on why they permitted online conspiracy theorists to promote falsehoods on YouTube, Facebook and Twitter. "I represent Parkland, Florida, and in this discussion of social media, the first thing that comes to mind, for me, is the savage attacks on the student survivors of Stoneman Douglas," said U.S. Rep. Ted Deutch, a Democrat. "One of the most virulent strains of these attacks was that the students didn't survive a school shooting, that they were crisis actors, that they were planted by some mysterious cabal to finally get Congress to do something about gun violence." Deutch noted the rumors that InfoWars had promoted against the students and the site’s previous notoriety for promoting a conspiracy theory that the 2012 Sandy Hook shooting had never happened. "How may strikes does a conspiracy theorist, who attacks grieving parents and student survivors of mass shootings, get? How many strikes are they entitled to before they can no longer post those kinds of horrific attacks?" Deutch asked the tech executives. Juniper Downs of YouTube said a channel typically could violate YouTube policies three times before it was removed. Monika Bickert of Facebook said the company used a similar model but declined to give a number of violations required, noting that it "depends on the nature of the content that is violating our policies." A month later, the tech sites, led by Apple, all banned InfoWars from their platforms. In the case of Parkland, it’s hard not to conclude that the lies didn’t stop the student movement. It may have in fact fueled it. "Every attempt to attack the student survivors online brought more attention to what they were trying to do to mobilize their community and their generation," Deutch told PolitiFact recently. He also said he believed fast debunkings were critical going forward. "At a time when it's so easy to spread misinformation on social media and on the Internet, I think one of the big takeaways out of all of this — and frankly the other attempts to spread misinformation over the past couple of years — is to call it out," Deutch says now. "To not let it get legs on these conspiracy theory websites only to see it seep into mainstream social media, but to call it out right from the start." Update: This report has been updated to note that Rumpf's story was changed soon after publication. We originally said it was within hours, but the precise timing is unclear.